El Caminito del Rey (The King’s Little Pathway) is a walkway, pinned along the steep walls of a narrow gorge in El Chorro, near Ardales in the province of Málaga, Spain. The name is often shortened to Camino del Rey (King’s Pathway). 15 april – 31 may 10:30 – 17:30 h.
1 – 30 june 10:30 – 18:00 h.
1 july – 31 august 10:30 – 19:00 h.
1 – 8 september 10:30 – 19:00 h.
9 september – 27 september 10:30 – 17:30 h.
Let us take you on a fascinating journey. Every step will reveal something new, from a face to face encounter with sharks to a hands-on rockpool experience. Discover a small bubble of the ocean at SEA LIFE Benalmádena. Graceful rays, the Costa del sol´s largest collection of seahorses, an explosion of tropical coloured fish… and much more. Interactive Zone, find out how it feels to touch a starfish, hermit crab and toher creatures living in our Interactive Rockpool Experience. Daily Activities, Animal feed, face-painting, quiz trail and fun talks. There´s plenty for all the family to enjoy at SEA LIFE. Explore Africa, the wildest and most exciting of continents. Get to know its fauna, cross its hanging bridges… Enjoy a thrilling adventure in the great outdoors. Dolphins shows, you can take a photo with the sea lions, squirrel monkeys visit, amazon keeper talk, exotic birds exhibitions, penguins feeding time. A heavenly trip in the Costa del Sol. Falconry demonstrations, hunting with birds of prey. July and August at 22:00 outdoor planetarium. En Bioparc Fuengirola we recreate the wilderness of Africa and Asia with the island of Madagascar, Equatorial Africa, Southeast Asia and Indo-Pacific. One of the best zoos in the WORLD. More than 1,500 butterflies from tropical areas all over the world fly free inside the Mariposario. As their lifespan is only 2-3 weeks you will be able to find new species each visit. We exhibit more than 150 different species throughout the whole year. Many of the butterfly species reproduce in the park itself, so besides butterflies you can observe all the stages of their fascinating biological cycle as eggs and caterpillars, and other behavior such as their courtship flights and mating. Every day new butterflies are born in the nursery, so do not miss the unique opportunity to see how they hatch from the chrysalis and spread their wings. You will be able to witness their first flight after the metamorphosis. Although the live butterfly species in the same space around the world there is no conflict or competition between them. The environmental conditions in the garden are the same as in their original habitats with 80% humidity and a temperature of between 24-29ºC. Have many reasons to visit the amusement park and entertainment Tivoli World, an experience to enjoy a fantastic day in a unique place in the Costa del Sol. Among fountains and gardens you will enjoy many exciting attractions, colorful and varied entertainment shows and entertainment that take place in different places and scenery and enjoy the many dining options to satisfy your appetite between restaurants and theme bars while enjoying the magnificent ambience of the park. A world of illusion to share with family !! Oficial prices Our prices ! Join World Championships of Magic award winner Marvelous Matthew Wright and Singing Sensation Alarna Love, accompanied by very special guest artists throughout the year for a spectacular, one of a kind evening of music, comedy, magic, illusion, escapes, mind-reading, and puppetry. The show is performed by a cast of world class performers; to tell the story of the Chamber of Secrets and the mysteries within. Set inside a beautifully decorated, air conditioned custom built theatre, over the space of two & a half hours in this spectacular English speaking show, you´ll be transported into a magical world where anything could and will happen ! Hilariously funny, deviously clever and perfect for all ages. Discover the most exciting sights of Malaga in our open top double decker bus on the Classic route. On this line you will go through and see all the main sights of the city, passing by the Museum of Contemporary Art, Malagueta Beac, the Catedral and many more.. Discover the most exciting sights of the charming city of Benalmadena from the top deck of the City Sightseeing bus. 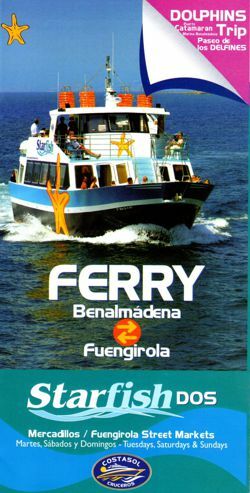 Included bus to Málaga and return. The Benalmadena Marina is the most astonishing port and residencial complex in Europe. Its architecture mixes Indian, Arabic and Andalusian feautures, and its artificial islands lend it an special charm. This has been awarded as the Best Marina in the World.